Two decades later, some of Trochmann’s philosophical heirs, led by an Arizonan named Ammon Bundy, hijacked an Oregon wildlife refuge. As I write, more than 40 days into the occupation—and after a riveting, wild night of web-streamed manifestos, songs, prayers, and negotiations that unfolded like a unedited live broadcast from the subconscious of right-wing America—the final militant surrendered, despite loudly vowing “war” on the federal government. Meanwhile, Ammon, his brother Ryan, Montana militia activist Ryan Payne (the operation’s one-time second-in-command), and Bundy patriarch Clive are all in a Multnomah County jail. A roadside shootout left one occupier dead. It looks like it’s over—except it’s a long way from over. The exotic ideologies may be slightly different—it can be hard to sort out the far right’s sovereign citizens, Posse Comitatus, renegade Mormon offshoots, and so forth. But by vowing to seize federal land for “the people,” Bundy’s cadre followed Trochmann in a distinct and perennially vigorous antigovernment tradition. Early in the January standoff, wits called the militiamen Y’All Qaeda or Yee’hawdists; last night, some Twitter wag branded them Branch Stupidians—a hostile but ridiculous alien force, in other words. To me, they recalled my old fellow Kinko’s customer, whose idea that armed citizens should be a legitimate force has become a mainstay of a far-right subculture that’s small but thriving across my home region. 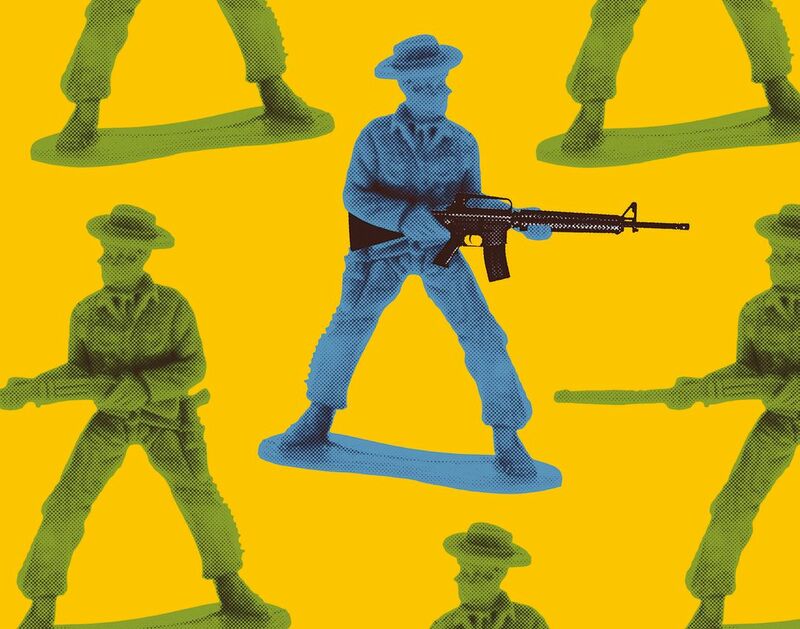 While the militiamen can seem like outliers, their actions spring from the history and culture of the West—a character that shapes West Coastal urbanites, too. This itself may seem odd, but back then I didn’t consider Trochmann and his followers—the Militia of Montana was always more PR machine than real force—especially strange. Extreme, yes. Wrong, definitely. But out-there beliefs were not unusual in that place and time: the ’90s got weird in the interior West. The militia movement—MOM began in 1994—took root in a complicated loam of underground right-wing politics blending white supremacy (in some cases) with New World Order paranoia (in some cases) and Second Amendment rigidity (in some cases). The specifics varied, a the vibe got heavier as the decade wore on and the conspiracy-minded, for instance, whispered about UN-trained Gurkha commandos mobilizing in the woods. But the left, such as it is in the Mountain States, also dabbled in extremes. The eco-saboteurs of Earth First! enjoyed radical-chic status in college towns like Missoula, and everyone was reading The Monkey Wrench Gang. In 1996, just 78 miles north of where Trochmann and I made our copies, the FBI arrested Theodore Kazcinsky, the anticapitalist Unabomber. My own little Kinko’s projects used communist and anarchist iconography—albeit with a heavy dose of collegiate irony. Violence pulses through western politics, from the vigilantes of the 1850s and ’60s through the labor strife that roiled the early 20th century. (Centralia, Washington, seems sleepy today, but in 1919 left-wing union activists and armed “patriots” waged a battle in the little town’s streets that killed six.) Many observers have linked the Bundy battalion to the ’70s Sagebrush Rebellion, which also involved land-control confrontations and sabotage. And someone’s always trying to hatch Utopia out here. In the 1980s, followers of the Bhagwan Shree Rajneesh created their own city in Central Oregon and poisoned 751 people in The Dalles by sabotaging salad bars. A decade later, a militia-ish outfit called the Montana Freemen proclaimed “Justus Township” and engaged in an armed standoff with the feds. Those groups share nothing but a powerful magical thought: that the West’s vast landscape is the destined home of some new, splendidly isolated society. Whether lived out on a rural compound or distilled in a crunchy-liberal food-canning workshop, the urge to go it alone remains strong on the former frontier. The irony there is that the West is the ultimate Big Government project. (Ask a Native American.) Everyone here, from weekend hiker to fourth-generation rancher, relies on public land, which is why battles over that land define the region. (In the New York Times, writer Tim Egan noted that some of the Bundy militiamen’s demands don’t stray far from what many members of Congress want to do with this commonwealth—i.e., privatize it.) The Harney County siege thus serves as a reminder that this land is, in fact, our land. The West is a web of economic, social, and environmental connections, not a patchwork of rugged individualists, and the Bundy stand-off is symptomatic of deeper rural economic and social distress. An idea: Urban westerners (the ruling political bloc in states like Oregon and Washington) could get a clue about what’s going on “out there.” Y’All Qaeda jokes can be funny. But to really counter the militia’s fantasy-land politics, knowing something about rangeland management or rural economic development would be better. Harney County may seem like the middle of nowhere, but it’s really right next door.